Shelly Liburd, who oversees community housing assistance projects in the Ministry of Social Development; Pastor Ron Daniel, Hillary Shield; Lorraine Cassandra Phillip; the Hon. Eric Evelyn, minister of social development in Nevis; and Keith Glasgow, permanent secretary in the Ministry of Social Development, at a ceremony to hand over a house to Phillip June 14. The Hon. 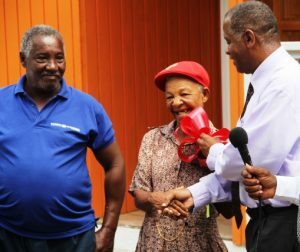 Eric Evelyn, minister responsible for social development on Nevis, hands the keys to a new home to Lorraine Cassandra Phillip. Her partner Hillary Shield looks on. With a little help from the Hon. 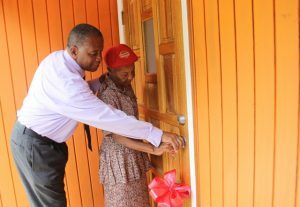 Eric Evelyn, minister responsible for social development on Nevis, new home owner Lorraine Cassandra Phillip opens the front door to her dwelling at Fountain Village, a gift from the ministry. 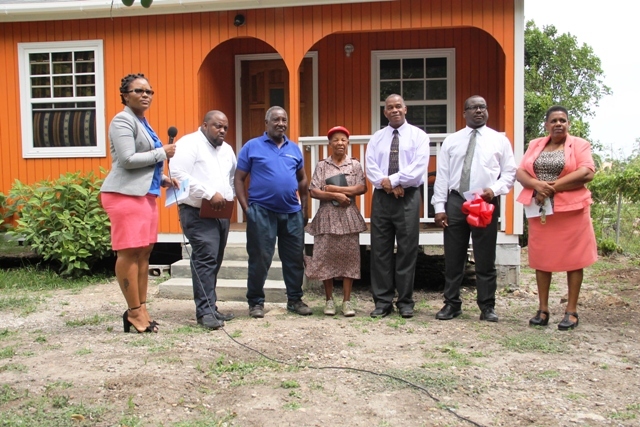 The new home of Lorraine Cassandra Phillip at Fountain Village, a gift from the Ministry of Social Development in the Nevis Island Administration, as part of its Community Housing Assistance Programme. CHARLESTOWN, Nevis – “Thank you for helping me along my journey and I wish God will bless you all and thank you” were the words of gratitude that an otherwise vivacious Lorraine Cassandra Phillip of Fountain Village could manage moments after she accepted the keys to her new home from the Honourable Eric Evelyn, minister of social development at Fountain Village in St. James’ Parish June 14. 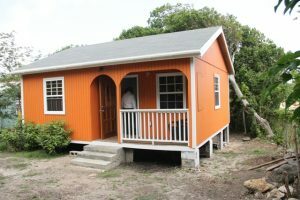 Prior to handing her the keys, Evelyn said the Nevis Island Administration (NIA) was pleased to take care of her housing need and encouraged her to take care of her new home. “I [have] know Cassandra for a very long time,” he said. “She is a live wire and I know that she is extra happy that we are here this morning to hand over the keys to her. We want you to take very good care of your property. It is a lovely property. The minister thanked his predecessor, the Hon. Hazel Brandy-Williams, under whose leadership the project to house Phillip began. He also thanked the Hon. Alexis Jeffers, area representative for St. James Parish, for seeking permission from the land owners to construct the home for Phillip. Keith Glasgow, permanent secretary in the Ministry of Social Development, explained that they had experienced some difficulties and it took longer than expected before the project was completed. He commended the land owners who gave permission to construct the house for Phillip, saying the Jeffers family understood that all must help to eradicate poverty from within the society. Phillip, who is a senior, had been renting the plot of land where the house was constructed for some time. Glasgow also acknowledged Brandy-Williams and Jeffers, who among others were instrumental in the project. Joyce Moven, deputy director of the Department of Social Services, said the Ministry of Social Development and the department cater to the most vulnerable people in the community. She stated that as part of the National Social Protection Strategy, the department makes the assessments to determine those most in need and provide the necessary assistance to ensure they have a better standard of living, which embraces the Sustainable Development Goals of alleviating and eradicating poverty in the community. The handing-over ceremony was chaired by Shelly Liburd, who overseas community housing assistance projects, and Pastor Ron Daniel gave the blessing. Also present was Phillip’s partner, Hillary Shield.